Situated approximately one hours’ drive south of Brisbane, Australia’s Gold Coast is a city coming of age. Strategically located on the edge of the Asia-Pacific rim, with access to two international airports, the Gold Coast is perfectly positioned as a destination for business, investment, study, sport, events, tourism and lifestyle. Situated in the south east corner of the state of Queensland, the Gold Coast stretches along 57 kilometres of coastline and is home to over half a million people. Beyond the city’s beautiful beaches are vast, sub-tropical rainforests with breathtaking scenery. There are several options for travel to the Gold Coast including train, bus, car, taxi, limo, and shuttle. If you need to get to Gold Coast Airport from Brisbane via bus see AA Express which picks up from Toowong, Roma St, Sunnybank and Garden City then to Gold Coast Airport. There’s a morning service which gets to the Gold Coast airport at 6.45AM and afternoon service arriving at 7.25PM. There’s also returning service. A taxi from Brisbane to the Gold Coast is outside the metered zones, you would need to ask the driver for a quote. An estimate would be between $150 and $300. Contact Yellowcabs or Black and White cabs. You can catch a train directly from either the Brisbane Domestic, Brisbane International direct to the Gold Coast. The train begins at the Airport Domestic terminal, then proceeds to the nearby International Terminal. You can also catch the train in the Brisbane city at either Eagle Junction, Wooloowin, Albion, Bowen Hills, Fortitude Valley, Brisbane Central, Roma Street, Cultural Centre/South Bank or Park Road stations. On the way to the Gold Coast, it stops only at Coopers Plains, Loganlea, and Beenleigh. There are six stations on the Gold Coast itself, being Ormeau, Coomera, Helensvale, Nerang, Robina and Varsity Lakes. On the Gold Coast, the train stations are located inland from the centre of the city so you’ll likely need to catch a connecting bus or taxi to your final destination. If you are coming to the theme parks then get off at Coomera, if Southport is your final destination then choose Helensvale Station, for Surfers Paradise/Broadbeach it’s Nerang Station, for Miami/Burleigh/Coolangatta choose Varsity Lakes Station. 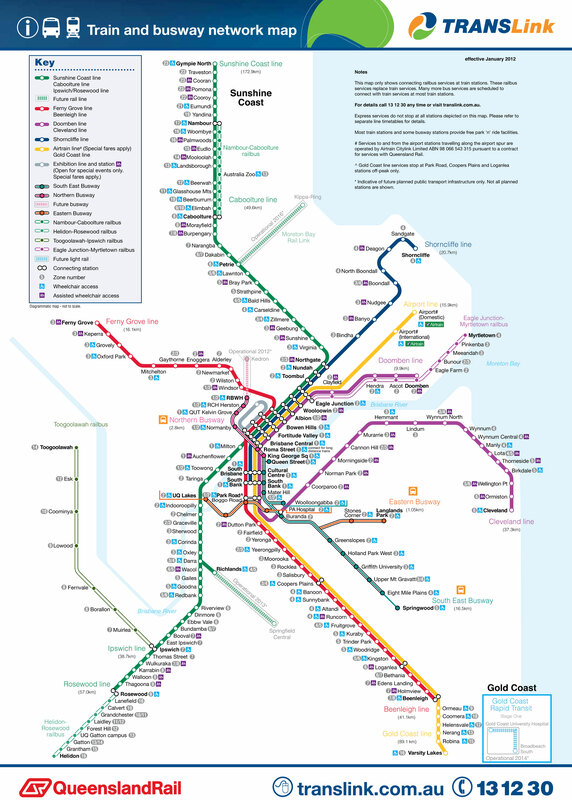 For a large map showing all the stations see Brisbane and Gold Coast rail network , for timetables and planning bus connections from the stations see Translinks Journey Planner. The trip time for the train is about 90 mins from Brisbane to the Gold Coast, as a more exact example from Brisbane Domestic Airport to Surfers Paradise (via a connecting bus from Nerang Station) would take about 2 hours and 17 minutes. There is also the Airtrain service, which is the same train as above but you can opt to have a chauffeured car for the connection rather than use the public bus which is called AirtrainConnect, see airtrain.com.au. If you are going to be using public transport in South East Queensland then get an SEEQ card, it’s prepaid and makes traveling a breeze, see SEEQ Card from TransLink. If your driving from Brisbane to the Gold Coast it’s best to avoid the peak periods if at all possible. The morning and afternoon rush hours are no fun. Outside of the peaks it normally takes just over an hour. You leave Brisbane by taking the Pacific motorway and after traveling for 30km or so, you’ll need to consider which exit to take. The Smith St Motorway will get you to Southport, Main Beach & Surfers Paradise. For Broadbeach, Mermaid Beach it’s the Nerang-Broadbeach Road exit. For Miami, Burleigh it’s the Reedy Creek Road Exit. That’s just three major exits, try google maps for directions, as an example here’s Brisbane to Surfers Paradise map. Also note that speed cameras operate throughout the area, so check the signs.